See What I am Buying at Target! 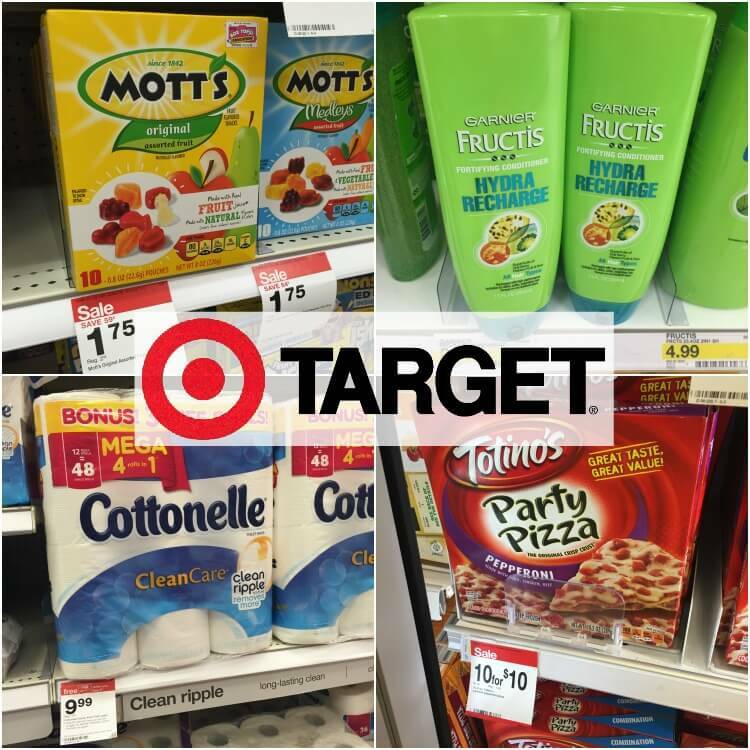 Home / Deals / See What I Am Buying at Target! Target has Totinos Pizzas for $1 this week or only $0.75 each when you buy 4 after the Printable Totinos Pizza Coupons! Use Zip Code 63366. My kids sure love these things :) Target has the Mott’s Fruits Snacks for $1.75 on Price Cut this week and if you use the $0.50 Mott’s Fruit Snacks Coupons, they are $1.25! Easy! The 12 packs of Cottonelle Mega Rolls (equals 48 regular rolls) are priced at $9.99 and when you buy 4 packs, you will get a $10 Gift Card. If you buy 4 and use 4 of the $0.50 Printable Cottonelle Toilet Paper Coupons, you will pay $37.96 out of pocket and get a $10 Gift Card. That is like paying $27.96 or just $6.99 which is $0.58 per mega roll or $0.15 per regular roll! $6.99 ea. wyb 4 after coupons and Gift Card! The Garnier Shampoo & Conditioner is priced at $2.99 and Buy 4, Get a $5 Gift Card. If you buy 4 and use 4 of the Garnier Fructis Coupons, you will pay $7.96 out of pocket and get a $5 Gift Card which is like paying $2.96 or only $0.74 each! Target has these 16 ct. Pads for $3.99 and Buy 3, Get a $5 Gift Card. You can buy 6 boxes and use 3 Playtex Pads Coupons and you will pay $11.94 out of pocket and get 2 $5 Gift Cards. That is like paying $1.94 or getting them for $0.32 per box! $0.32 ea. wyb 6 after coupons and Gift Card! Target has 8 packs of Viva Giant Rolls (Equals 12 Reg. Rolls) for $9.99 and Buy 2, Get a $5 Gift Card. If you buy 4 packs and use the $1 Viva Paper Towels Coupons from the 1/3 Smart Source, you will pay $35.96 out of pocket and get a $10 Gift Card. That is only $25.96 or only $6.49 per pack- $0.54 per Regular Roll! $6.49 ea. wyb 4 after coupons and Gift Card! Target has the 100 load bottles of Purex Detergent are priced at $7.19 and Buy 3, Get a $5 Gift Card. If you buy 3 bottles, you can use 3 Purex Laundry Coupons for $1 off and a Cartwheel for 10% off. You are going to pay $16.45 out of pocket and get a $5 Gift Card. You can then get back $0.75 from Ibotta! That is like paying $10.70 for 3 bottles or just $3.57 each! That is under $0.04 per load which is my stock up price! $3.75 ea. wyb 3 after coupons, Ibotta, and Gift Card! Best Price on Chevron Pacifier Clips!